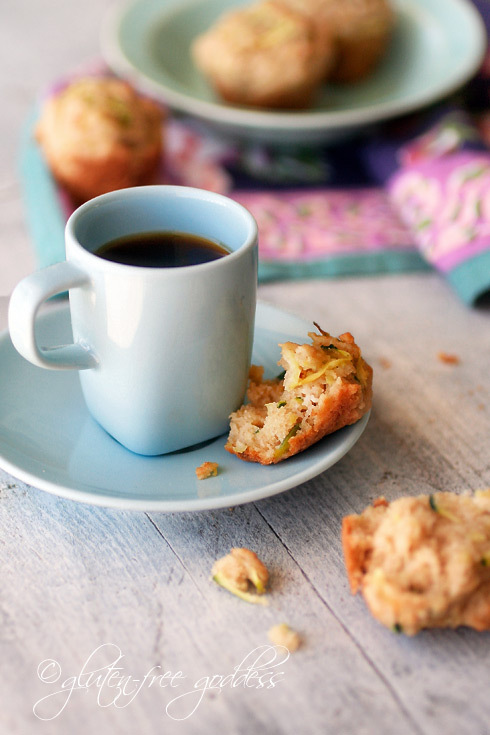 Almond flour and zucchini mini-muffins sweetened only with pure maple syrup. That's right. No cane sugar. Almond flour and bourbon vanilla bring their subtle, natural sweetness to gluten-free muffin recipes, so why cloak it with a heavy dose of sugar? And adding a lip-smacking kiss of ginger wakes up the zucchini (which tends to fall asleep in baking recipes, due to utter lack of commitment and verve). I've added quinoa flakes for extra protein, and brown rice flour to round out the whole grains. And a small bit of tapioca starch- to give these whole grain based muffins some lift. Now the only hitch is, don't eat all twenty-four at once, Darling. Tell yourself you're only going to eat one. Because that fourth delectable bite of nary a muffin- really, it's only a tease of a muffin- might stir your desire for a fifth. And the next thing you know, half the mini-muffin pan is empty. And you are standing, wide-eyed and innocent, brushing baby sized crumbs off your chin, when your husband swings around the corner into the sunlit kitchen and inhales, declaring, Sweet Tapdancing Buddha, it smells good in here! What did you bake? And thinking lickity-split fast you tell him, I made a dozen almond flour zucchini mini-muffins. Recipe originally posted June 2011. I was pleasantly surprised at how light and delicate these almond flour, brown rice, and quinoa flake muffins were. In fact, I had to eat three just to make sure the first impression of sweet muffin bliss was not a fluke. I hope you'll like this delicately flavored low sugar muffin as much as I do darling. Preheat the oven to 350ºF. Line a mini-muffin tin with paper liners, if you like. Or let them bake naked like I did (just grease the pan). In a large mixing bowl, whisk together the almond meal, quinoa flakes, sorghum flour, potato starch, baking powder, xanthan gum, sea salt, ginger, cinnamon and nutmeg. Add in the maple syrup, oil, beaten eggs, and vanilla. Beat the batter until it is smooth and slightly sticky. Add in the shredded zucchini and stir by hand to combine. Spoon the muffin batter into twenty-four mini-muffin cups. Don't worry about smoothing the tops. Bumpy is cool. Bake in the center of a preheated oven for about 20 minutes, until the tops are golden and firm to the touch. A wooden pick inserted into the center should emerge clean. Cool the muffin pan on a wire rack for five minutes. Gently ease the muffins out of the pan to continue cooling on the rack (don't cool them in the hot pan- they'll get soggy). Why I prefer sorghum flour- beyond the soft texture and lovely crumb- I'm now using less brown rice and brown rice flour, and eating fewer rice cakes, etc. Here's why- there is elevated arsenic in rice. 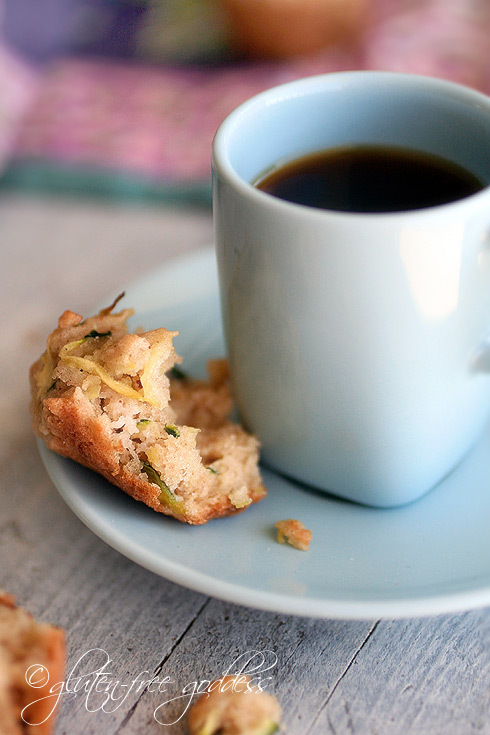 These light as air little babies are lovely for breakfast, or a late morning espresso. Warm from the oven they are sublime. As far as substituting various flours- yes, it is possible. And I suggest following my suggestions in Baking Substitution Help. Medium weight gluten-free flours do best subbing for fellow medium weight g-free flours. So if you avoid brown rice flour, for instance, try millet flour, teff flour, or certified oat flour as an appropriate sub. I seldom never recommend using those metallic tasting (not to mention, gassy!) bean flours, or ho-hum gritty-sticky white rice flour. These have less sugar than your average muffin. As always, enjoy sugary treats in moderation. Gluten-Free Goddess advises consuming no more than 2 tablespoons of sugar a day.